Scale the summit of the largest sculpture in Britain for a bird’s eye view of the city, just take the lift and ride down the slide! 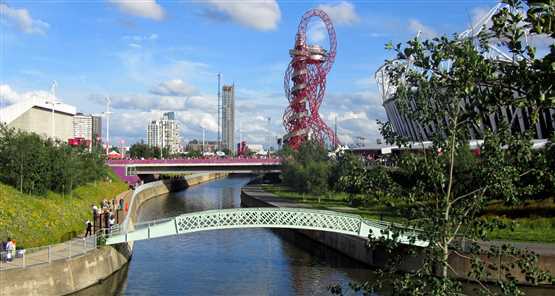 A defining feature of the 2012 London Olympics, ArcelorMittal Orbit cheap slide tickets provide visitors with a unique insight into the Queen Elizabeth Park. The brain child of Sir Anish Kapoor and engineer Cecil Balmond, its breath-taking, innovative design has been praised around the world and established what is the largest sculpture in Britain as a landmark in its own right. Constructed out of enough bolts and steel to make 265 double-decker buses, the ArcelorMittal Orbit Cheap offers allow visitors to take advantage of stunning panoramas stretching over twenty miles across the London skyline as well as the many meadows, wetlands and waterways that make up the Queen Elizabeth Olympic Park. With the help of interactive screens, gain a fascinating insight into the surrounding area, while memories of 2012 come flooding back thanks to spectacular views of the Aquatics Centre, Velodrome and world famous Olympic Stadium. My teenage children and I had a fantastic time. It was totally worth it!!! I hope you enjoy the slide as much as we did. Easy and quick. Great experience. Loved the experience, great views from the platform and the slide was awesome. The slide was good fun, we were lucky we had no queue. We got there 30 minutes early and they let us go straight up, which was good. The structure itself is amazing and the views were great from the viewing platform. The ride it self was very fast with lots of twists and turns. It was just a shame it was over so quickly. Very well organised and run though. Good fun great view from the top. Fantastic experience, brilliant fun and amazing views. A definite 'must do' in London. Great experience, well worth the trip to the Park on its own. Staff very friendly and helpful, highly recommended but not for the faint-hearted!! Amazing! If you like big slides I cannot recommend having a go on this slide enough - it was a fantastic experience! Worth every penny and I even got a small discount by booking through Discount London!